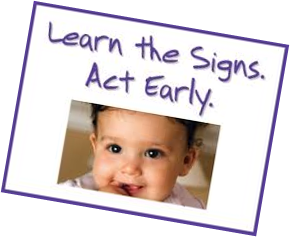 The North Carolina Act Early program is a statewide campaign associated with the national "Learn the Signs. Act Early." program run by the Centers for Disease Control and Prevention (CDC). The CDC began this initiative to improve early identification of autism spectrum disorder (ASD) and other developmental disabilities so that children and their families can get needed services and supports as early as possible to optimize their children's developmental outcomes. For access to free CDC handouts and materials, take the CDC Act Early website tour. The NC Act Early website was developed in collaboration with the North Carolina Autism Alliance and the NC Act Early Ambassador. The Act Early Ambassador project is a collaborative effort developed by the CDC's National Center on Birth Defects and Developmental disabilities (NCBDDD), the Health Resources and Services Administration's (HRSA) Maternal and Child Health Bureau (MCHB), the Association of University Centers on Disabilities (AUCD), and the Association of Maternal and Child Health Programs (AMCHP). The collaborative aims to promote a network of state-level experts to help improve early identification practices. Rebecca Edmondson Pretzel, Ph.D., serves as the Act Early Ambassador in North Carolina. She is a psychologist and Associate Director of the Carolina Institute for Developmental Disabilities at the University of North Carolina at Chapel Hill. Dr. Pretzel's primary clinical and research activities are focused on the screening, assessment, and treatment of young children with or at risk for developmental delays or disabilities, including ASD, and their families. If you would like additional information about the "Learn the Signs. Act Early." program, please contact Dr. Pretzel at becky.edmondson@cidd.unc.edu.